Home / Belmont Stakes 2018 / 2018 Belmont Stakes Super Screener Now Available! 2018 Belmont Stakes Super Screener Now Available! Can Justify win the Triple Crown? What long shots have the best chance to hit the board? The answers to these questions and more are in the 2018 Belmont Stakes Super Screener! Get your copy now and get a head start on a big score. The Belmont Stakes winning criteria is totally different from the Kentucky Derby and Preakness – with unique qualities only found in a 1 1/2-mile race. Get the whole story and horse-by-horse analysis of the current Belmont contenders. Justify is a strong contender, but you don’t want to miss the one horse who could spoil his Triple Crown party! Justify Clinches Triple Crown – Belmont Day Results! 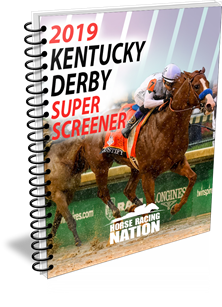 Preakness Super Screener Now Available! Big Blue Grass Weekend Cashes + KY Derby Implications!